Barrel-shaped Oyster sports watch in steel with integrated crown and screwed back (signed and numbered) Blue metallic dial with large applied steel indexes, large second hand, double date and day by aperture at 3 o'clock, luminescent spatula hands.Steel strap with vintage deployant buckle.Movement: Mechanical automatic winding caliber signed MIDO / Eta 2790 Swiss base. 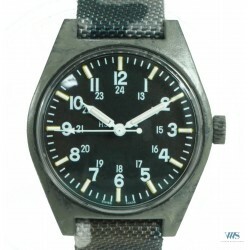 Large aperture sports alarm clock watch in steel with screwed porthole back in sapphire crystal (apparent movement, numbered).Black dial with dots index and luminescent cathedral hands. Railway alarm clock disc, date at 3 o'clock and a red arrow for the alarm function (set by the crown at 2 o'clock).Purple crocodile strap with pin buckle and a sports box strap.Movement: Mechanical automatic winding caliber AS / 5007 Swiss. 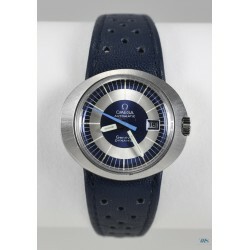 Barrel-shaped sport watch in steel from the Seamaster collection, smooth bezel, horn handles with export punch and screwed back bearing the hippocampus logo (signed and numbered). 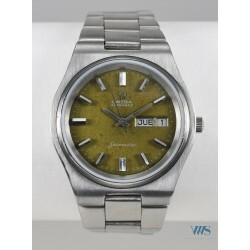 Silvered metallic dial with large second hand, applied stick indexes, double date window at 3 o'clock and spatula hands. Vintage sport strap in rubber and a crocodile leather strap. Movement: mechanical automatic winding caliber signed OMEGA / 752 Swiss. Large ​aperture​ sports watch​ in steel​ with screwed back (signed and Slate-grey metallic dial with applied steel logo and indexes, tritium dot and spatula hands. Leather sports ​strap and a leather lizard​ strap. 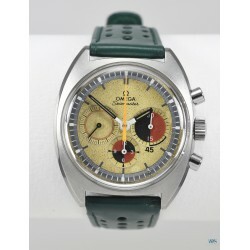 Movement: Mechanical manual winding caliber signed OMEGA / 601 ​Swiss. Sports watch in steel with smooth bezel and screwed back specific to the brand (signed, numbered and bearing the Enicar logo on the shark).Slate metallic dial with applied indexes, date window at 3 o'clock and steel spear hands.Gay Frères vintage steel stap and orange sports leather strap.Movement: mechanical automatic winding Caliber signed ENICAR / AR 1141 Swiss. 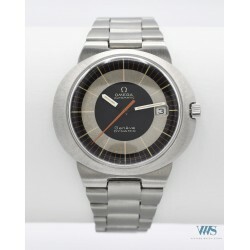 The watch "best seller" of the 70s, from the Omega factory, created in 1967, in a dial version with a double date at 3 o'clock (in German). Steel case oval tonneau shaped case with monobloc caseback (Tool 107). 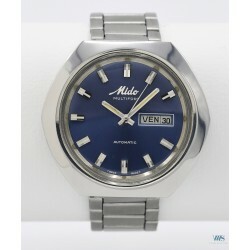 Silver dial with blue & white bezel, large second hand sky blue, sun indexes and luminescent hands. 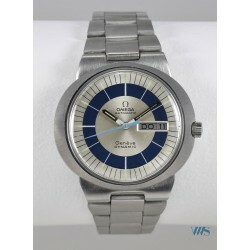 Integrated Omega steel strap with deployant buckle. Movement: mechanical automatic winding caliber signed OMEGA / 752 Swiss. 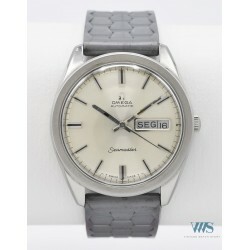 Rare medium-sized Seamaster model (usually signed Dynamic) from the Omega Deville collection. 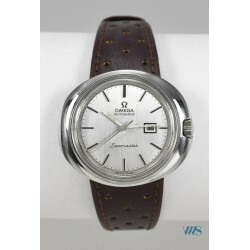 Ovalised steel case from the 1970s with integrated brown Omega leather strap (fastened with the back of the screwed case). Brushed silver dial with applied indexes (light trace at 10 o'clock), date at 3 o'clock, luminescent spear hands and large central second hand. Movement: mechanical automatic winding caliber OMEGA / 681 Swiss. 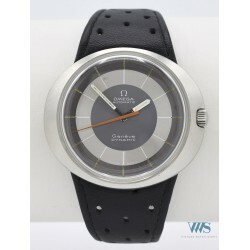 The watch "best seller" of the 70s, from the Omega factory, created in 1967, in a rally red dial version with a simple date at 3 o'clock. Steel case oval tonneau shaped case with monobloc caseback (Tool 107). Dial rally silver with bezel second black and red, large second hand orange, stick indexes and luminescent hands. 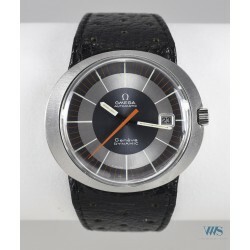 Integrated Omega strap vintage in black leather. 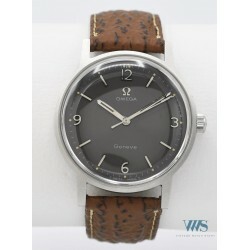 Movement: mechanical automatic winding caliber signed OMEGA / 565 Swiss.